Recent release “The Healing of Windwalker A Story of Love, Hate and Redemption” from Page Publishing author Donald L. Chadd is both thrilling and enlightening; this work tells a story of two cultures and the struggles between the two. 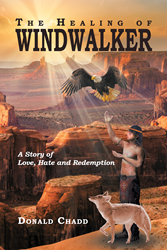 Donald L. Chadd, a husband, father, Native American culture and history buff, animal lover, devoted writer and author, has completed his new book “The Healing of Windwalker A Story of Love, Hate and Redemption”: a gripping and potent tale of love, life, courage and acceptance. Published by New York City-based Page Publishing, Donald L. Chadd’s poignant tale is a unique twist to the classic good versus evil plot. At six years of age, the orphaned Windwalker, a.k.a., "Walker", is given to LDS Placement Services by the Navajo Indian tribe to be placed with an adoptive LDS family. In the loving and Christ-centered environment his foster home provides, Walker matures physically, mentally, and spiritually. As the years pass and Walker turns fifteen, he and his foster family anxiously await the necessary tribal consent for his adoption to take place. During this time Walker has a vision in which he sees himself entrusted with the responsibility of getting an urgent message to his people. He is to tell them that they will not become a great nation until they lay down the false traditions of their fathers and take up the true traditions of the ancient ones. As Walker prepares mentally and spiritually for his mission and for the long-awaited adoption, he is unaware of the forces working against him and his family to prevent the adoption. When Walker finds out who is responsible, he puts together a diabolical plan to get revenge. With a hate-filled heart and his vision all but forgotten, he executes his plan and his life spirals out of control. When Walker discovers he is dying, he knows he has reached the point of no return. He is grief-stricken as he realizes that he has failed not only God, but his beloved family and his people. He is afraid there is no hope for him either in this life or in the next so he goes to live alone on a mesa to pray for forgiveness and to await his impending death. Can Walker ever be forgiven for what he has done? Will Walker's urgent message to his people ever be delivered? Readers who wish to experience this profound work can purchase “The Healing of Windwalker A Story of Love, Hate and Redemption” at bookstores everywhere, or online at the Apple iTunes store, Amazon, Google Play or Barnes and Noble.